We have become a country of “Awareness.” Certain months are dedicated “Awareness Months.” October is no exception. 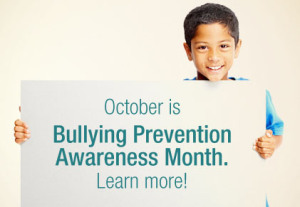 Along with (in alphabetical order) Aids, Breast Cancer, Domestic Violence, Down Syndrome, Lupus and Vegetarian Awareness, it is also Bullying Prevention Month. Since October 9th is Unity Day, let’s Unite Against Bullying. Bullying has reached epidemic proportions. If you don’t know that, you’ve been living under a rock. Complaining about it or ignoring it just doesn’t cut it anymore. While I’m strongly recommending it’s time for everyone to take a stand and intervene, as a Christian, I’m calling on everyone reading this who is also Christian to take this as a particular challenge – yes, you – don’t walk away from this. We all need to take a stand in three ways – and one of the ways I’m going to suggest is probably not going to be very popular (see #1b). We tend to focus on the victims. We tend to ask our kids to invite victims to in, to include them. I agree. We need to do that so victims are not isolated. But we also need to begin to focus on the bullies. #1a – If you’re a parent, talk to your kids. Convince them to be courageous. Ask them to stand up to a bully. Ask them to use their voices. Ask them to yell, “STOP!” Good and loud. More than once. Because if they yell, someone else will yell, too. #1b – Additionally, get serious about letting your kids know that you expect them to never, ever tease or make fun of anyone for any reason. Let your kids know it’s not okay – ever – to call anyone names. Make sure your kids know that names DO hurt. Let them know you expect them to treat every single person with respect – period. And let your kids know there will be consequences if they tease, make fun, or call someone names. Serious consequences. And follow through. Because kids in emotional pain are killing themselves. Then be a role model. Don’t tease your kids. Don’t call them names. Don’t call other people names. Not your neighbors. Not your relatives. Not the President. Not people of other religions. Treat them with respect. All of them. All the time. Are you a Christian or aren’t you? Are you different, or are you of this world? Do you follow Jesus, or do you follow those that don’t know him? If you call yourself a Christian, then belly up to the biblical bar and stop being lukewarm. Get off the fence. Be unashamed and speak out. Start loving your neighbor out loud. #2 – If you’re a teacher, read #1a and 1b and put the word “teacher” in place of the word “parent.” Get a grip. Step up to the plate. Don’t make excuses. And if you know one of your kids is a bully, lovingly get that kid into counseling. Don’t blame, don’t shame; get the child help. Now. #3 – So you’re not a parent, and you don’t have a kid. Have you noticed someone at work or in one of your college classes being bullied? Yeah, now it’s your turn. Get in there and do something! Don’t just walk away. Don’t tell yourself that just because you’re not contributing means you’re not part of the problem. That’s simply a lie you tell yourself so you don’t have to get involved. Straight up. If you’re not part of the solution, then you are a part of the problem. If you are not stepping in and making it your business to insert yourself into the situation then you are definitely a part of the problem. So get yourself involved and become a real part of the solution. Well done … often the kids are hurting on both sides … I wrote about a bully who had such a heart for animals and a gift for music … her mother joked publicly about never wanting her, preferring her dogs … and that she needed to be tough because she herself had to be tough as a kid … the entire parent population of that year level (we had left the school) made a protest about the chid being at the school … yet the child had great compassion and great potential, sadly the victim (the mother) became the bully, who then had a child she didn’t want, who then became the victim who then became the bully … and so it went on … it’s time we all did our bit to break the cycle! Amen. Especially after today’s new in Nevada. So very heartbreaking. We must keep praying and reach out to all kids with compassion and love. I’m in Australia, so I haven’t heard, but we have had our own tragedies here which are related to bullying. Another tragic school shooting – middle school. One teacher and two students dead; the student who did the shooting shot himself. So, so, sad. That is sad … Will pray for the community. Blessings. We have to; I just don’t see a way around it. My daughter, as a teenager, was stalked by someone on her mobile phone who threatened to kill her. As soon as we got the police involved and then found out it was a friend of a friend (some friend, huh?) it stopped but I’ve never forgotten the pain it caused her and us. It is so easy for vicious people these days to hide behind the anonymity enabled by modern technology to cause great and very deep pain, sometimes with tragic results. Words DO hurt, you are absolutely right. Great links and education about this awful problem that MUST be dealt with head on. Thanks so much for highlighting this extremely important social issue Susan. You’re welcome, Sherri. Saw it too many times as a teacher, and too many times other teachers and parents just looked the other way. We just can’t do that any more. Always happy to send folks your way. You do amazing work in a straightforward and loving manner.